Aarons Tree & Landscaping Services offers a LARGE variety of areas in which we can proudly assist you! Below are a few of those areas! For concerns not listed, please feel free to contact us! CABLING: This is not a do-it-yourself project. An arborist needs to determine the right height for one or two cables, he’ll climb the tree and drill a hole through each main branch and insert a threaded, galvanized eyebolt that is held in place with a large washer and two nuts. The two eyes are connected using steel cable. To keep the trunk from splitting, he may also drill crisscrossing holes through the trunk for threaded rods. The tree will eventually grow over and hide the rods, but it can’t be allowed to cover the eyebolts, which have to be inspected, and perhaps adjusted, every year or two as the trunks grow. CAVITY FILLING: A tree cavity is similar to a cavity in your tooth. Without proper treatment, the situation will only get worse. Unfortunately, cutting down on sweets and brushing regularly will not help to prevent a tree cavity. In simple terms, a cavity in a tree is a neglected bark injury that can be the result of many factors. The most common are improper pruning, mechanical injury and storm damage. Storm damage and injury from gnawing animals and landscape equipment (lawnmowers and string trimmers) contribute to bark injury by tearing the bark from the tree trunk or branch. When bark injury has occurred, the exposed sapwood or heartwood is more susceptible to attack by fungi that initiate the decay process. Insects and animals such as raccoons, woodpeckers and squirrels that inhabit tree cavities utilize the tree wound as the front door to their new home. Carpenter ants, in particular, will excavate tunnels throughout the decayed portion of the tree and excrete wood preserving enzymes as they do so. While these preservatives are beneficial to the tree, the tunnels the ants create allow water to accumulate. Excess water simply facilitates the wood rotting process. VERTICLE MULCHING: Vertical mulching is the process of making many holes in the soil of the root zone of a particular tree with the purpose of creating many entryways for air, moisture, and nutrients to reach the roots of a given tree. 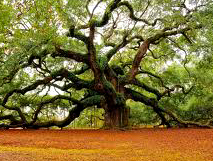 This process improves the overall health and vigor of any tree. To properly vertical mulch, an electric or gasoline powered drill and a 2 to 3” diameter auger is required. 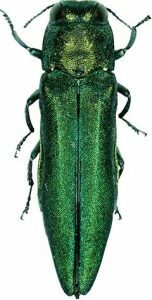 EMERALD ASH BORE: The emerald ash borer (Agrilus planipennis or Agrilus marcopoli and EAB) is a green beetle native to Asia. In North America the borer is an invasive species, highly destructive to ash trees in its introduced range. The damage of this insect rivals that of Chestnut blight and Dutch Elm Disease. To put its damage in perspective the number of chestnuts killed by the Chestnut Blight was around 3.5 billion chestnut trees while there are 3.5 billion ash trees in Ohio alone. Dutch Elm Disease killed only a mere 200 million elm trees while EAB threatens 7.5 billion ash trees in the United States. The insect threatens the entire North American Fraxinus genus, while past invasive tree pests have only threatened a single species within a genus. Since its accidental introduction into the United States and Canada in the 1990s, and its subsequent detection in 2002, it has spread to 14 states and adjacent parts of Canada. It has killed at least 50 – 100 million ash trees so far and threatens to kill most of the ash trees throughout North America. The green ash and the black ash trees are preferred. White ash is also killed rapidly, but usually only after green and black ash trees are eliminated. Blue ash displays some resistance to the emerald ash borer by forming callous tissue around EAB galleries; however, they are usually killed eventually as well.